Kate Woodman has an amazing vision with her photography and color work. Based on the reception of her recent color toning set, The Cinematic Collection, people have been wanting to learn more! She created this incredible tutorial that I thought could prove helpful to many who are looking to expand their vision too! This guest post by Kate goes into detail with her technique. She shares one of her most popular tutorials with us from her blog! I ended up posting this image in a forum I belong to and got some overwhelming feedback (thanks to everyone who took the time to look and comment! ), and a lot of requests for color grading tutorials, so in order to appease the internet masses, I’ll attempt to guide you through my process of creating this look here. Disclaimer: I am not a Photoshop master. I’m sure anyone who is will look at this tutorial and cringe. 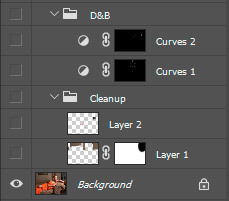 To make matters worse, I have a habit of being incredibly indecisive when it comes to color toning, so often times it takes me 4 layers to do what someone more knowledgeable (or decisive) could do in 1. But I’m a firm believer in growing by experimentation, and hopefully as my knowledge base improves, so will my efficiency. The obvious first part of the process here is to remove the unnecessary components of the image. For me, the picture hanging on the wall, the radiator pipes, the speaker, and the white window frame all took away from our model, so with some cloning, healing and dodging and burning, these elements were removed. Jessica also had a bit of a hot spot on her forehead, which I toned down a bit with some d&b. Layer 1 (Blend Mode-Normal/Opacity-100%): Removal of picture on wall, radiator pipes and trim. Layer 2 (Blend Mode-Normal/Opacity-100%): Removal of white window frame, wrinkles in fabric (chest area), speaker, and speaker wire on floor. (I tend to get a bit carried away sometimes with D&B so often times when I’m done I’ll reduce the opacity to back down from the uber perfect look—especially in a portrait). The biggest issue I had with the original image was the neon orange color which I felt didn’t suit the mood, which called for a darker, more muted color. I decided on a deeper red to compliment the walls and couch, both a mossy greenish-brown color. To accomplish this, I masked out the dress to avoid disrupting any other portions of the image with similar tones, such as her skin. (There are a number of tutorials online on masking far more in depth than this one allows, so I will skip over the particulars). I used a couple of adjustment layers, starting with a Hue/Saturation layer, and adjusting the red tones and then followed with a couple color fill layers to enrich and enhance the color. The next step was to reduce the overall brightness and contrast of the image, which I felt to be too severe for the overall mood. By compressing the dynamic range, it gives the image a more painterly feel. It’s worth noting that this is something that probably could (and should) have been done in camera a number of ways: feathering the light to avoid hot spots and contrast, using a white fill, etc. At the time, my lighting skills weren’t comprehensive enough however—live and learn, right? Black & White (Blend Mode-Luminosity/Opacity-12%): Reduce overall brightness, particularly in red values. 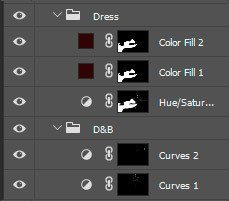 (You could probably do this with curves as well by adjusting individual color curves). Curves (Blend Mode-Normal/Opacity-58%): Increased black values and decreased whites for compressed dynamic range (except at dark areas underneath the side table and at the window). Exposure (Blend Mode-Normal/Opacity-44%): This is the one trick I do to almost all my images. I bump up the offset, bring down the gamma correction, and increase exposure, then usually back down on opacity a bit. I don’t really know what those terms mean, but it adds a bit of matte look and ever so slightly reduces detail in the shadows. Levels (Blend Mode-Normal/Opacity-100%): The last layer in the section is a levels layer to bring down the whites a bit. Again, this can probably be done with a curves layer too. As they say, there’s more than one way to skin a cat. Instead of applying this overall, I applied this only to the lighter midtones and highlights by going to Image>Apply Image and setting the blend mode to Multiply. This is where we currently are. Here we are with our newly red dress and our dynamic range reduced to give us that more painterly feel—but the colors still seem a little….blah. To me, the first thing that I don’t love is that the image is overall very warm. Her skin looks a bit orange, the red dress is a bit browner than I was going for, and the walls and couch don’t really look as green as they are in person. I promise, they both are green, it took me three trips to Home Depot to get that wall color right and I reupholstered the couch myself to match (my husband thinks I have a problem--I prefer to call it attention to detail). The first step for me is to desaturate the image a bit. This helps reduce the orange in her skin and dress and give it a more cinematic feel. I used a Black & White adjustment layer, with the blend mode set to color to do this--you could also do this with a Hue/Saturation or Vibrancy layer, but these affect the image globally. Instead, I wanted to add some depth to the reds, so I set the B&W layer to a modified blue filter to bring the tones down. Next, I started playing around with the overall grading. I wanted to maintain the complementary red/green color scheme in the midtones, but also introduce a secondary complimentary color scheme in the highlights and shadows. I opted for a red-violet undertone in the shadows (one stop over on the color wheel) because I thought it removed some of the brown in the dress and made the red color punch. Conversely, I added a bit of very pale yellow-green (like a lighter/warmer version of the sofa and wall color) back into the highlights—just enough to reduce the pinks in her skin. *A quick aside: It's important to understand the distinction between opposite/complimentary colors in Photoshop vs. traditional color theory. The classic color wheel is based on the RYB color model; however, Photoshop uses the RGB model. In RYB, the opposite of blue is orange, but in RGB it is yellow, as shown in the Curves module. Now we're getting somewhere. At this stage, I'm liking how the shadows look, but the walls, skin and sofa are still too orange. I could probably go back to the curves layer to adjust this, but for the sake of variety (and experimentation), I used a gradient map set to very low opacity. A gradient layer maps the equivalent greyscale range of an image to the colors specified in the fill--in this case, oranges in the highlights and purples in the shadows. However, since we wanted to reduce the amount of orange, I set the blend mode to Difference which basically subtracts the gradient colors from the image. Because our other gradient color is a very dark purple, we don't lose a lot of color from the shadows. This layer also decreased the brightness in the highlights and midtones. Black & White (Blend Mode-Luminosity/Opacity-24%): Used to reduce overall saturation and darken red tones. Curves 1 (Blend Mode-Normal/Opacity-100%): Added magentas to the shadow, greens to the midtones and highlights; reduced blue and red midtones. Curves 1 Copy (Blend Mode-Normal/Opacity-36%): I started with the layer above and decided I needed to kick it up a notch, so I duplicated this layer and reduced the opacity until I got something I liked. Gradient Map (Blend Mode-Difference/Opacity-10%): The colors were still feeling a bit too warm to me, so I wanted to add some greens by subtracting orange from the image. Vibrance (Blend Mode-Normal/Opacity-100%): At this point the image was feeling a bit too desaturated so I decided to bump up the vibrancy some. I used vibrancy instead of saturation because saturation tends to go a little crazy with red sometimes and I wanted a more subtle effect. I could probably have tweaked my existing black and white layer to achieve a similar effect, but then I may have affected the depth of the red dress which I didn’t want to fiddle with. Selective Color (Blend Mode-Color/Opacity-100%): I still wanted to bump up the purples in the shadows, so I used a selective color layer set to color blend mode (so as not to affect the contrast), and increased the magentas and cyans in the blacks. Color Fill (Blend Mode-Color/Opacity-18%): Increased greens in the highlights to bring skin tones closer to the wall and couch colors. Instead of applying this overall, I applied this only to the highlights by using the same Apply Image trick mentioned previously. Color Fill 2 (Blend Mode-Color/Opacity-4%): For the final touch, I used another color fill layer to add just a bit more greens to the skin tones and wall. I just manually brushed in the area I wanted to affect here with a layer mask. 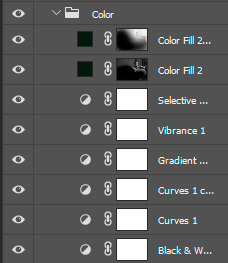 There are an infinite number of color combinations to choose from when color grading an image. It’s worth mentioning that I didn’t have a definitive plan for the color going into this. A lot of it is just experimentation and playing around with what looks good to my eye. As you have probably noticed, this is often an iterative process of building up the look one layer at a time--and there are many different ways of utilizing layers to achieve the same look. This is the most creative, but also can be the most frustrating part of the process, as the opportunities are virtually limitless. I often times work on an image only to come back two days later and start completely from scratch. So there you have it! I know it can be overwhelming at first (trust me, it's still overwhelming to me), but as you keep practicing and keep training your eye, it’ll get much easier and you’ll be color grading like a pro in no time! Download a free action from Kate Woodman! Free is always great! Here is an action celebrating the Cinematic Collection by Kate Woodman. This action is completely free and not part of the collection, so you can't get it anywhere else. We hope you like it! If you download it, all we ask is to share what you create with it in our Facebook Group or tagging us on Instagram using hashtag #fineartactions or tagging our account @fineartactions! We can't wait to see what you do with it.